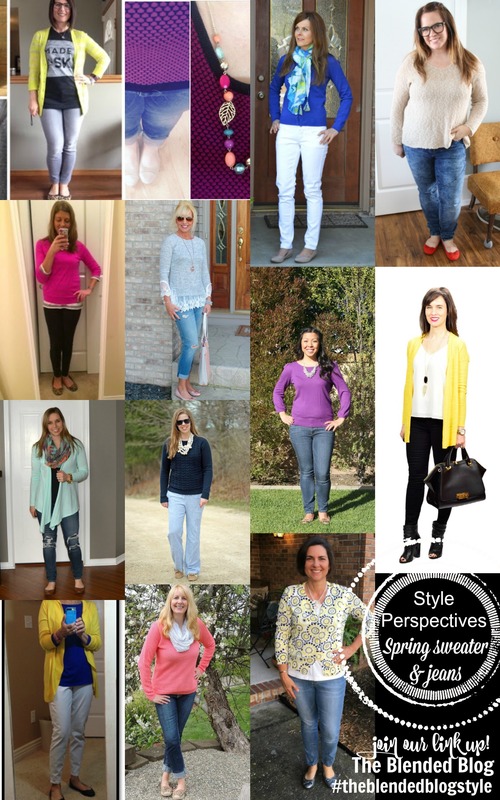 Welcome back to week seven of the Style Perspectives! 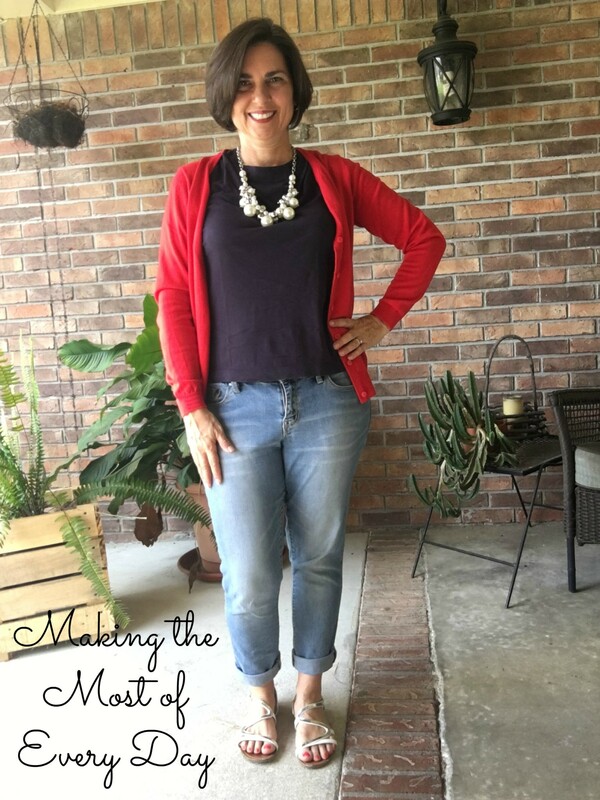 Fourteen bloggers have picked a look that defines their personal style and are being featured on the Blended Blog. The other bloggers show how they interpret the prompt for that day on their personal blogs and then we all link up. It sure is fun and you can play along too! 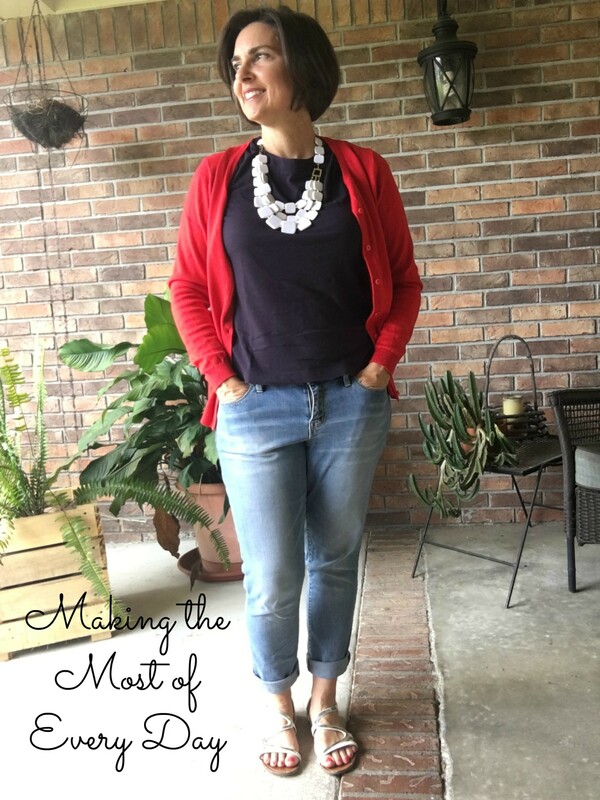 Today’s look is from Christy who blogs at r squared + g + c=our family. Although I do not know her in real life, those who do know her say she if famous for her statement necklaces. I can’t wait to see what she features! Not too long ago, I didn’t wear statement jewelry. I preferred demure, dainty, classic pieces, but when I joined the Style Challenges, I learned to embrace this trend. Let’s see why. 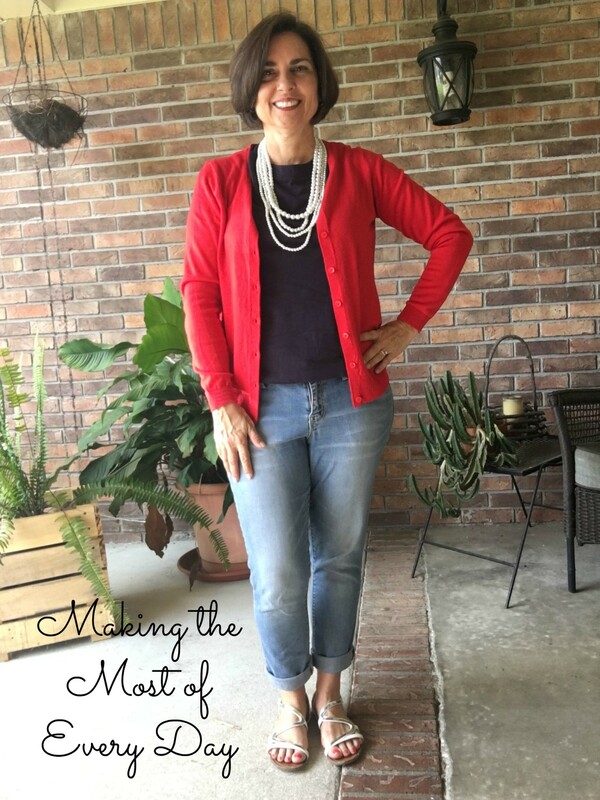 This would have been a normal outfit for me: jeans, tee, sandals with a cardi if the morning or venue promised to be on the cool side [under 80 degrees]. This outfit would be completed with a small gold necklace, probably with a small cross charm on it. Short. Always short. Then I discovered a choker length, thicker necklace and I started wearing bigger charms or slides. This one is one of my absolute favorites. I love how just this one star dresses up the outfit, turning it from ho-hum, to one with interest. In the challenge, we were encouraged to try a longer necklace. This is not the first long necklace I bought but it is the one I own that makes the biggest statement. I love all the little silver circles. Perhaps my most favorite statement necklace is this baubley pearl one. It is what several fashionistas have nicknamed RPBs [ridiculously blingy pearls] and I reach for these again and again to spice up an otherwise boring outfit. Thanks to Pinterest and my love of RPBs, I was on the hunt for a multi-strand pearl necklace and found this one. This one is a relatively recent addition to my jewelry wardrobe and is climbing the charts in popularity. 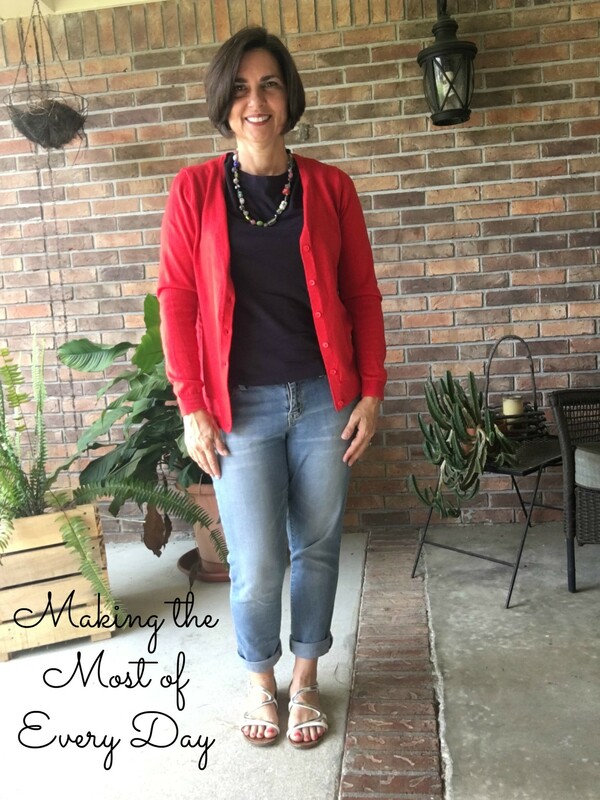 Especially when it’s warm and you don’t want to wear a scarf, or you have several colors in your outfit that you want to pull together, another option is a multi-colored bead necklace. I have two: a shorter one [pictured] and a longer one. And finally these white, flat, square beads are another alternative to bring a simple formula of an outfit – jeans, tee and cardigan – to a pulled-together ensemble. There you have it folks! 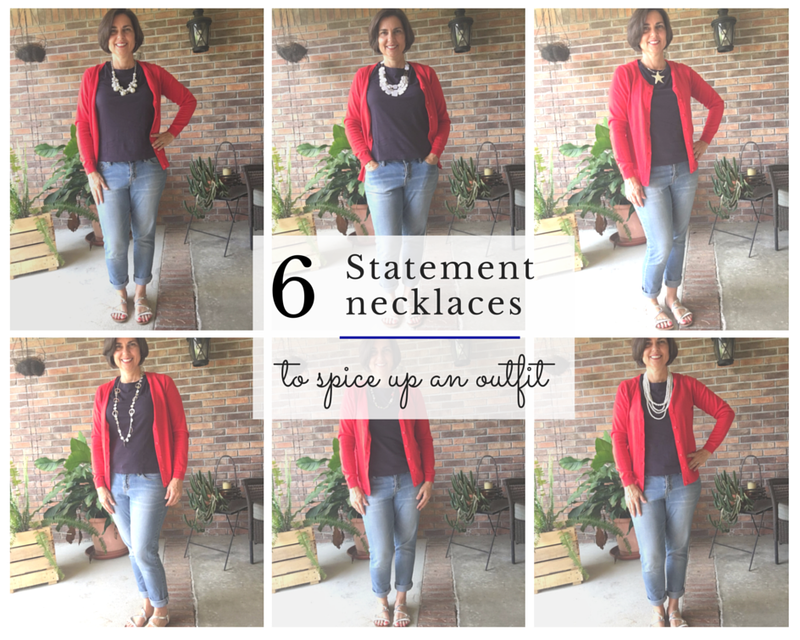 Six different ways you can use a statement necklace to take a blah outfit to a BAM outfit! Before I go, take a look at last week’s look below. Isn’t it fun to see how everyone interpret’s the prompt? Don’t you want to join us? 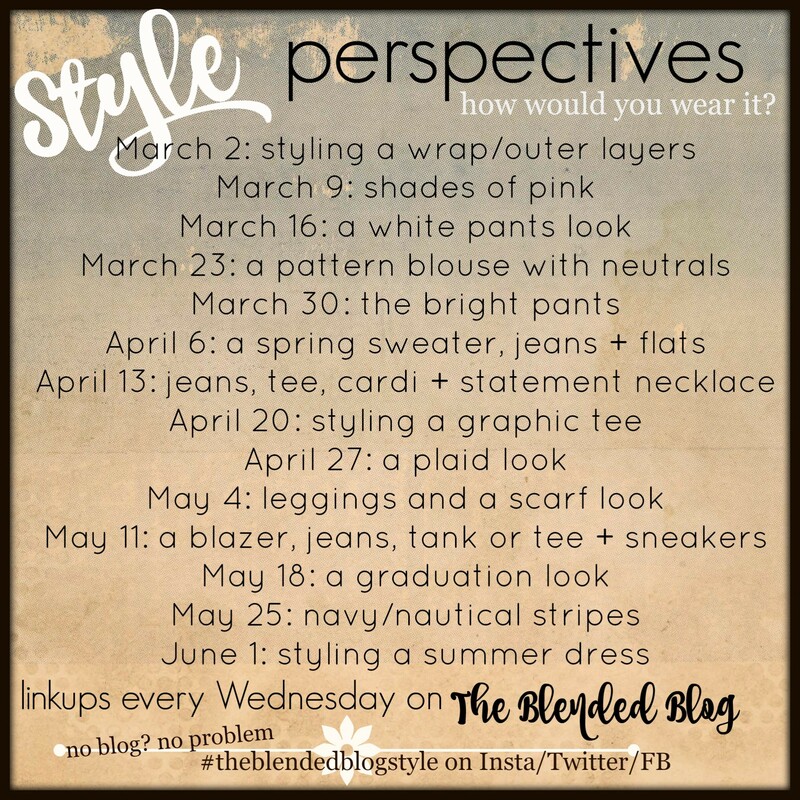 If you’re a blogger join us by linking up on the Blended Blog to show us how you would wear the prompt!And if you don’t blog you can join in though your favorite social media by using the hashtag #theblendedblogstyle. Can’t wait to see what Deena has up her sleeve next week for the graphic tee! Do you wear statement jewelry? Do you have a favorite? 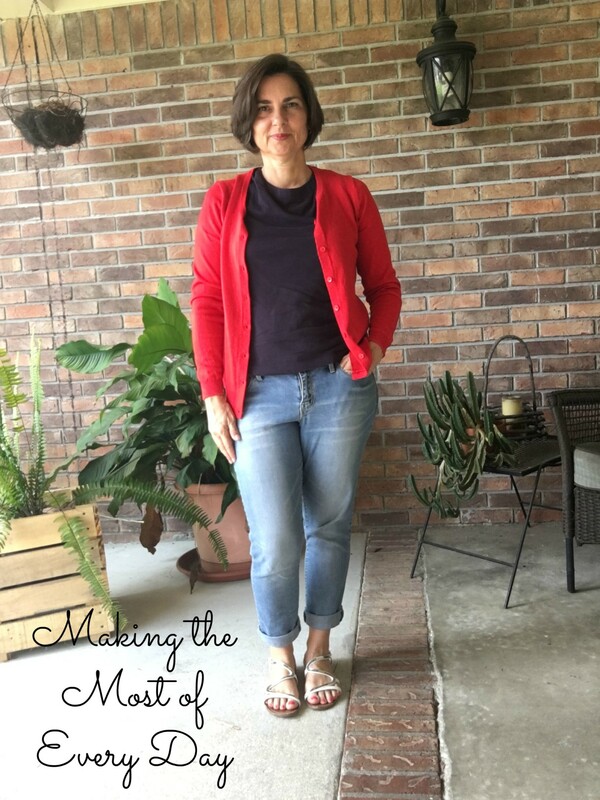 Great post, Sheila! Great pics! My wardrobe could use a little help in this area. I’m eyeing your multi-strand pearls! Thanks Michael Ann! I got those for a steal at Beall’s Outlet! I had a coupon so I only paid $2 for them! It was one of the things I was willing to break my shopping ban for! Pinterest had some cute outfits with a similar necklace. I know, right? How could I pass them up?? Great post. Love that you styled different necklaces ! Great looks and lots of fabulous necklaces! Good gravy, woman, this is an outstanding post. I wore the same petite-sy necklaces you did before GYPO. That is one lesson well learned…bigger is often better in statement necklaces and sometimes other things, too. Love everyone of these looks. Crazy how one accessory can make such a difference. Genius you are. We learned so much through those challenges! Thanks for your sweet comments Lesie! I never wore statement necklaces before the style challenges either, but now I love them. All great looks on you! And now I think I’m going to go pack my rbp’s for Vegas! Can’t wait to meet you tomorrow! Those RBPs are my fav! Those are 6 great necklaces. I think the pearls are my favorite – or maybe the star choker. I do like that star choker! I’m on the lookout for similar big slides like that one. ohhhhh that starfish necklace is LOVELY!! 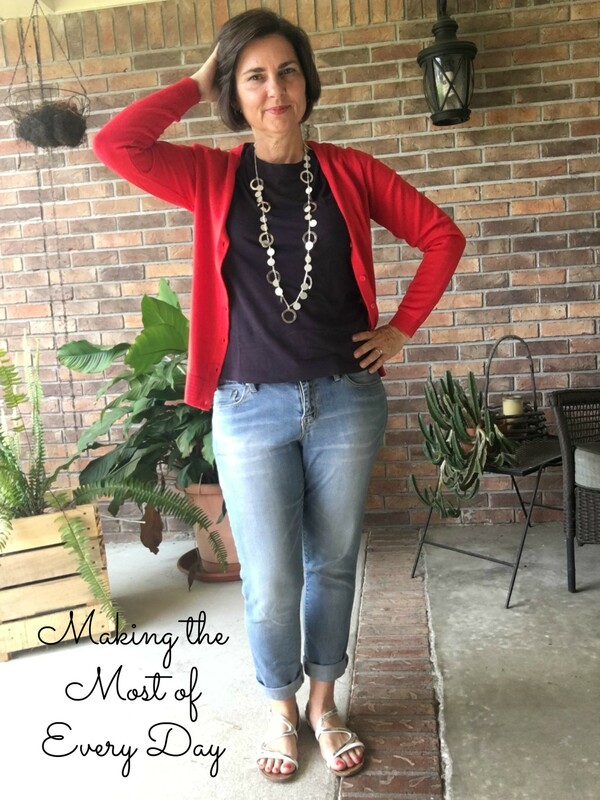 Isn’t it crazy what a statement necklace can do?! My favorite is the big pearl one! Can’t go wrong with big pearls 🙂 I’m excited to continue getting to know you through The Blended Blog! Yes, those RPBs are the best! I look forward to getting to know you as well Whitney! Such fun series, Sheila! You look so good with each and everyone of them. I like the one with the little silver circles. Gotta go find my statement necklaces, it’s been months without wearing one! 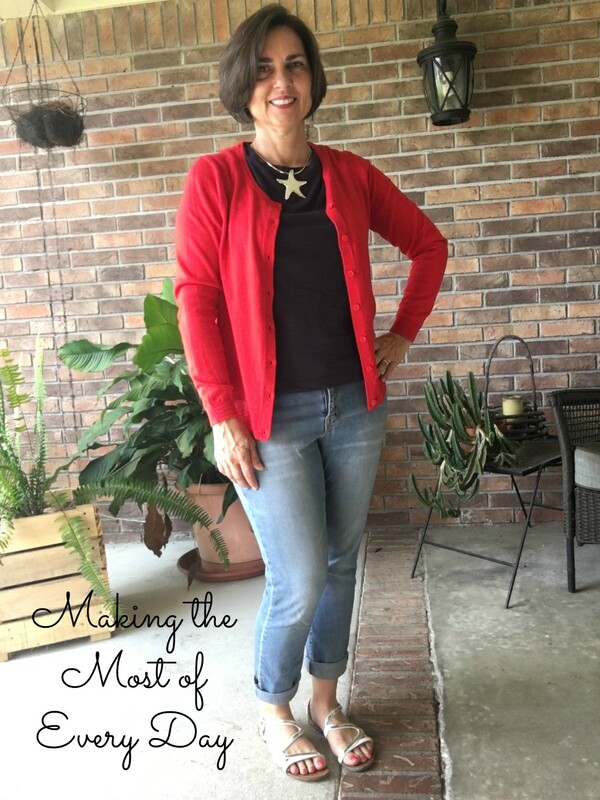 I love how a statement necklace can complete an outfit! Thanks for stopping by Cristina! I love how you showed the same outfit with different necklaces. I like how different necklaces change the look of the outfit. Such a small change really makes a difference!